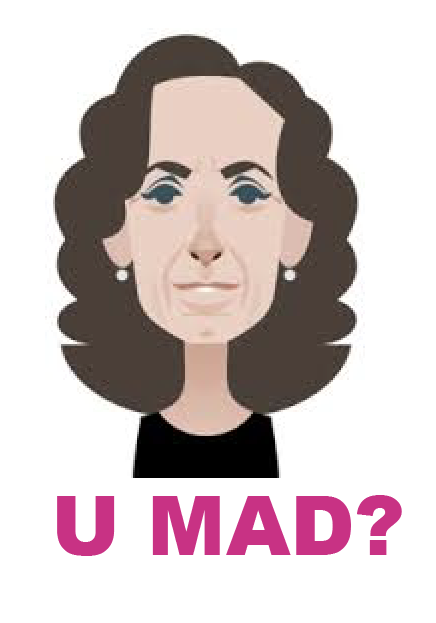 Heavens to Mergatroyd: The Better Angels: U MAD? Steven Pinker is still angry about Elizabeth Kolbert's review of "The Better Angels" in the New Yorker, "Peace in Our Time," seven years later. 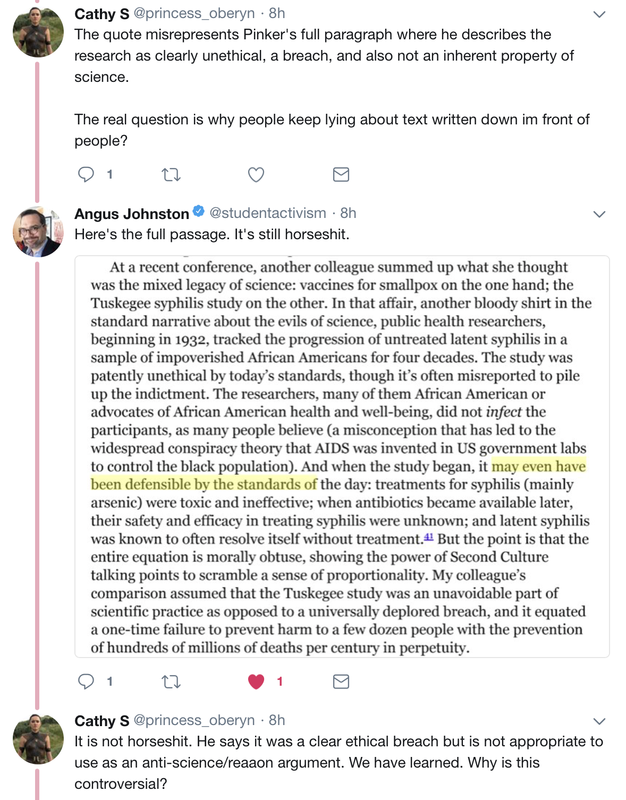 We can see it on display in his now notorious section about the Tuskegee syphilis study in his just-published "Enlightenment Now." It was brought to my attention in a Twitter argument I saw Angus Johnston have with a Pinkerite. You see, only people who don't understand what Pinker is saying - or are misrepresenting him - could possibly have complaints about Steven Pinker. The Serene Master is beyond reproach and the criticisms of ordinary, non-Pinkerite mortals. I'd be willing to bet that Pinkerite Cathy S has no idea why Pinker uses the term "another bloody shirt" in this context. But thanks to my having been critiquing Better Angels for the past several days, I do. Another possible take on Utøya—admittedly not a popular one—is that the whole incident was blown way out of proportion. In “The Better Angels of Our Nature: Why Violence Has Declined” (Viking; $40), Steven Pinker didn’t get a chance to comment on the Utøya shootings, since the volume went to press before the attack took place. Yet the book can be read as a long argument—a seven-hundred-page-long argument—for this last proposition. She's talking about Pinker's habit of dismissing contemporary acts of violence in order to shore up the thesis of Better Angels. Speaking of being misrepresented, Kolbert's thoughts on Pinker's claims about violence are repurposed by Pinker into "another bloody shirt in the standard narrative about the evils of science." It's great for this evo-psycho bro series that Pinker is so obsessed with reviews of "The Better Angels" it makes this section of the series au courant. 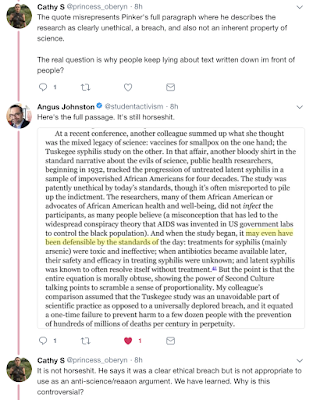 It is abundantly clear that Pinker tries to minimize the damage of the Tuskegee atrocity because he can't tolerate the slightest criticism of anything having to do with science. 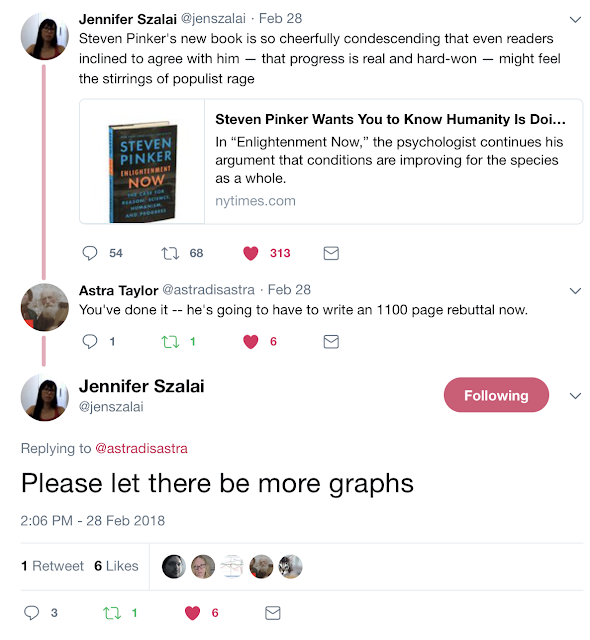 Because Steven Pinker is not rational. He's certainly not much of a scientist with his petty grudge-holding over seven-year-old book reviews. Pinker points to an evo-psycho/sociobiology/human biodiversity/hereditarian proponent when his book about violence is criticized. I'll talk more about that next. And before I forget, here's an excellent video by Rebecca Watson with even more criticisms of the book.